Have you checked out the Nest Cam IQ? It’s a pretty complex home security camera that’s packed full of cutting-edge tech, and yet it doesn’t even have some of our favorite security cam features. Specifically, Nest cameras are locked in position once you mount them. 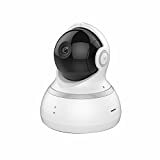 Meanwhile, the $60 YI Dome Camera can see every nook and cranny of any room because it can pan, tilt, and zoom remotely using the smartphone app. How cool is that! ?